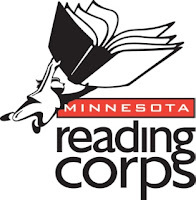 My name is Marisa Kadlec and I want to take a moment to introduce myself, as I will be serving as the literacy tutor for Minnesota Reading Corps. For those of you who are not familiar with Minnesota Reading Corps, it is a statewide initiative to help every child in Minnesota become a successful reader. Minnesota Reading Corps Elementary Literacy Tutors serve as one-on-one tutors and provide research-based interventions to help students become proficient readers by the 3rd grade. To read the rest of Marisa Kadlec's letter, please click on the link below.